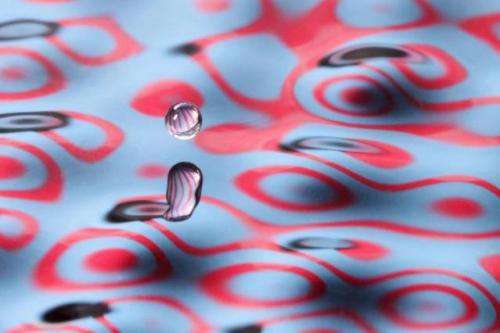 The central mystery of quantum mechanics is that small chunks of matter sometimes seem to behave like particles, sometimes like waves. For most of the past century, the prevailing explanation of this conundrum has been what's called the "Copenhagen interpretation"—which holds that, in some sense, a single particle really is a wave, smeared out across the universe, that collapses into a determinate location only when observed. But some founders of quantum physics—notably Louis de Broglie—championed an alternative interpretation, known as "pilot-wave theory," which posits that quantum particles are borne along on some type of wave. According to pilot-wave theory, the particles have definite trajectories, but because of the pilot wave's influence, they still exhibit wavelike statistics. John Bush, a professor of applied mathematics at MIT, believes that pilot-wave theory deserves a second look. That's because Yves Couder, Emmanuel Fort, and colleagues at the University of Paris Diderot have recently discovered a macroscopic pilot-wave system whose statistical behavior, in certain circumstances, recalls that of quantum systems. Couder and Fort's system consists of a bath of fluid vibrating at a rate just below the threshold at which waves would start to form on its surface. A droplet of the same fluid is released above the bath; where it strikes the surface, it causes waves to radiate outward. The droplet then begins moving across the bath, propelled by the very waves it creates. "This system is undoubtedly quantitatively different from quantum mechanics," Bush says. "It's also qualitatively different: There are some features of quantum mechanics that we can't capture, some features of this system that we know aren't present in quantum mechanics. But are they philosophically distinct?" Bush believes that the Copenhagen interpretation sidesteps the technical challenge of calculating particles' trajectories by denying that they exist. "The key question is whether a real quantum dynamics, of the general form suggested by de Broglie and the walking drops, might underlie quantum statistics," he says. "While undoubtedly complex, it would replace the philosophical vagaries of quantum mechanics with a concrete dynamical theory." Last year, Bush and one of his students—Jan Molacek, now at the Max Planck Institute for Dynamics and Self-Organization—did for their system what the quantum pioneers couldn't do for theirs: They derived an equation relating the dynamics of the pilot waves to the particles' trajectories. In their work, Bush and Molacek had two advantages over the quantum pioneers, Bush says. First, in the fluidic system, both the bouncing droplet and its guiding wave are plainly visible. 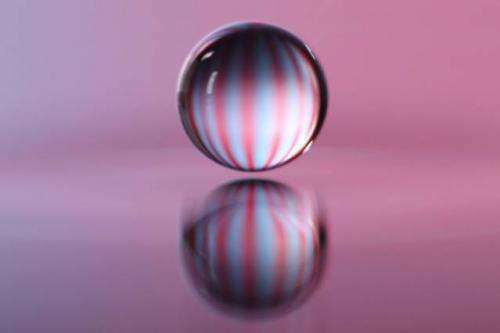 If the droplet passes through a slit in a barrier—as it does in the re-creation of a canonical quantum experiment—the researchers can accurately determine its location. The only way to perform a measurement on an atomic-scale particle is to strike it with another particle, which changes its velocity. The second advantage is the relatively recent development of chaos theory. Pioneered by MIT's Edward Lorenz in the 1960s, chaos theory holds that many macroscopic physical systems are so sensitive to initial conditions that, even though they can be described by a deterministic theory, they evolve in unpredictable ways. A weather-system model, for instance, might yield entirely different results if the wind speed at a particular location at a particular time is 10.01 mph or 10.02 mph. The fluidic pilot-wave system is also chaotic. It's impossible to measure a bouncing droplet's position accurately enough to predict its trajectory very far into the future. 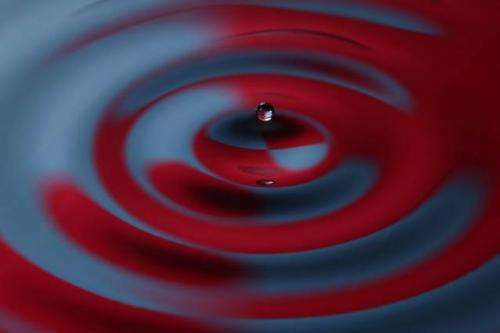 But in a recent series of papers, Bush, MIT professor of applied mathematics Ruben Rosales, and graduate students Anand Oza and Dan Harris applied their pilot-wave theory to show how chaotic pilot-wave dynamics leads to the quantumlike statistics observed in their experiments. In a review article appearing in the Annual Review of Fluid Mechanics, Bush explores the connection between Couder's fluidic system and the quantum pilot-wave theories proposed by de Broglie and others. The Copenhagen interpretation is essentially the assertion that in the quantum realm, there is no description deeper than the statistical one. When a measurement is made on a quantum particle, and the wave form collapses, the determinate state that the particle assumes is totally random. According to the Copenhagen interpretation, the statistics don't just describe the reality; they are the reality. But despite the ascendancy of the Copenhagen interpretation, the intuition that physical objects, no matter how small, can be in only one location at a time has been difficult for physicists to shake. Albert Einstein, who famously doubted that God plays dice with the universe, worked for a time on what he called a "ghost wave" theory of quantum mechanics, thought to be an elaboration of de Broglie's theory. In his 1976 Nobel Prize lecture, Murray Gell-Mann declared that Niels Bohr, the chief exponent of the Copenhagen interpretation, "brainwashed an entire generation of physicists into believing that the problem had been solved." John Bell, the Irish physicist whose famous theorem is often mistakenly taken to repudiate all "hidden-variable" accounts of quantum mechanics, was, in fact, himself a proponent of pilot-wave theory. "It is a great mystery to me that it was so soundly ignored," he said. Then there's David Griffiths, a physicist whose "Introduction to Quantum Mechanics" is standard in the field. In that book's afterword, Griffiths says that the Copenhagen interpretation "has stood the test of time and emerged unscathed from every experimental challenge." Nonetheless, he concludes, "It is entirely possible that future generations will look back, from the vantage point of a more sophisticated theory, and wonder how we could have been so gullible." "The work of Yves Couder and the related work of John Bush … provides the possibility of understanding previously incomprehensible quantum phenomena, involving 'wave-particle duality,' in purely classical terms," says Keith Moffatt, a professor emeritus of mathematical physics at Cambridge University. 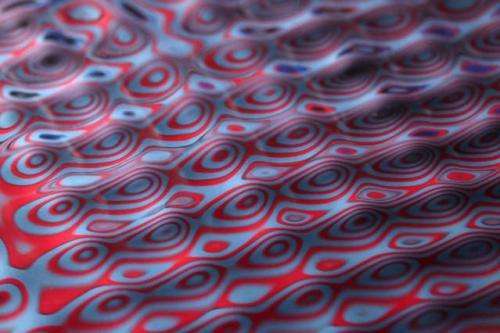 "I think the work is brilliant, one of the most exciting developments in fluid mechanics of the current century." Excellent and thought provoking article. It is always refreshing to see the world from a different viewpoint. These experiments HAVE NOTHING IN COMMON with light and matter waves, since the latter do NOT move within a medium, like the aether. This has been proved over and over an over again. Water waves ARE produced within a medium called water. To compare such experiments with light and matter waves only proves that the persons doing so have less brains than an idiot. And this at MIT??? Oh my God!! It is great to see such quality coverage in the mainstream media on the walkers. Great article, Larry. The field pictures are simply gorgeous, and a credit to Bush and his MIT team. I was impressed that it hinted at the randomness of bouncing, that is a signal we have been waiting for. for a take at the 'Copenhagen interpretation" and other magical cats. The point is mostly to equip the brain with pictures and ideas, categories, with which to speak of the QM formalism. The formalism works, and that is it's a posteriori philosophical self-justification (it works, period). Yes this is dependent on a aether, but aethers are the cat's meow in condensed matter. SR is just not an issue and is emergent in many studies. The speed of light is simply the fastest wave (no mass) in the media everything else has mass. The 2D predictions are not QM but they are interesting to understand QM. OMG waves! Drops of water! You sure this guy and you are talking sbout the same thing? Or are you using this article opportunistically to justify AWT because they appear to be the same thing? Thus could be your chance jigga. This guy uses math and experimentation to back up his theory. Maybe you could copy/paste something together to give AWT some cred. You don't want others to get all the credit do you? Jixo, with his 11 posts addressing himself, must think quite well of his own opinion. Let's see: the systems are both qualitatively and quantitatively different...but are they 'philosophically' different? Are 1 and �ž 'philosophically' different? 0 and i? -1 and 42? What absolute rubbish. Last I heard, there is no classical analog to the fact that a single quantum can self-interfere...but since both quantum mechanics AND classical mechanics both (amazingly) use mathematical addition (in their equations), they must be the 'same', right? Oh, btw the Copenhagen Interpretation (which I grew up with) has been superceded in most modern physics by several (well known, and old) alternatives. Its a good pragmatic but unsatisfying way to look at the non-intuitiveness of the subject. "Interpretation" is a word scientists like to use instead of "narrative" or "story"; sounds much more technical and objective, means the same thing. 12. Arom is one of Jixo/Zephyr's socks. Stop arguing with Jixo or Zephyr, or thefurlong, or the what have you. These trolls have been shown up again and again as being incurably insane crackpots. They make me sick!! ??? Have I ever acted as if I cared? I do not care. You however obviously care a great deal due to your 1000s of posts under dozens of sockpuppets... but still not enough to develop your theory past the poetry stage, as posted on a news site for amateurs. What is the purpose of it, if only pretending you are the only one intelligent enough to understand it? Man up. Post in forums full of scientists who will rip your guts out and then ban you. Whats that? Youve tried that already? I see. Bush believes that the Copenhagen interpretation sidesteps the technical challenge of calculating particles' trajectories by denying that they exist. YES! This, a thousand times this! And the reason why this is incoherent, is that no explanation is given for why we observe one particular outcome. You can't just say "it's random", because the decision has to be made somewhere. There's no such thing as "just random" - it's a meaningless, illogical statement. From that alone it's very clear that Copenhagen is just drivel - there's no CONTENT. I cannot emphasize enough how much the Copenhagen interpretation annoys me. You know how these news sites always say "quantum weirdness", "quantum entanglement" as if they're describing some mystical fairy land? NO. These are completely NORMAL things! They are EXACTLY what you would expect to see in a logical universe. It's properties like locality and the consistent speed of light that are profoundly abnormal. Can you imagine how baffling it would be if classical physics were TRUE? If fields were actual objects? There's so many problems with that kind of system that I don't even know where to start! For example it would mean that a) the universe contains an infinite information density, or b) the universe actually has the field equations written down and is calculating them out. Both of these are obviously absurd. But people keep pushing for the probability field to be a real thing, even without a discrete spacetime! Madness! Now, I will offer this criticism of the work in this article - this are replacing the truly horrendous "it's random" hypothesis with a somewhat less-bad "it's a field" hypothesis. If the field is asserted to be continuous, then they've wasted everybody's time. If they concoct a hypothesis using continuous-field mathematics, but acknowledge that in fact it must be discrete on the micro level, then I can live with it. Even better if they find some way to analyze the micro level dimensionality of spacetime in their hypothesis (with respect to single particles, NOT ensembles), because that actually has a chance of getting us somewhere meaningful. The unfortunate reality though, is that we probably aren't mentally capable of analyzing this situation right now. It's probably too far out of scope for our "RAM" capacity. In all honesty, I think that's why there haven't been any huge, fundamental physics revolutions for a few decades (i.e. since relativity and quantum). I agree completely with what you're saying - I totally agree that quantum randomness is real, and must be the result of things interacting "beneath the surface" as you say. This is deterministic randomness - the result has a cause, or a series of causes that in principle can be traced backwards in time. The trouble is, the randomness in quantum theory is usually considered to be nondeterministic - truly random. This means that there is no explanation given at all. The results don't have causes. The universe just chooses, 1 or 0, up or down, with no mechanism making the choice. That's why we have monstrosities like multiple universes, where they try to side-step the issue by saying that the universe makes both choices at the same time, and splits apart every time. It's unbelievable to me (and hopefully you) that people can take this kind of nonsense seriously, but they do! Excellent stuff. As a mere amateur with a keen interest in such matters, I know enough to understand that the Copenhagen interpretation is awesome enough to be widely accepted, and weird enough to beg for a better way. Just because one method of statistics has an impeccable track record does not mean that a better method does not exist. I believe it is unlikely that the Copenhagen interpretation will survive in a TOE. I wish good luck to the pilot-wave theorists in advancing our knowledge. After reading about the Constructor Theory of Information (Deutsch et al. ), I find myself attracted back to the idea of hidden variables as an explanation for the strangeness of quantum mechanics, and away from the ineffable nature of a world built according to the Copenhagen Interpretation. We surely live in interesting times. It might have been good for Phys.org to have mentioned that this topic has been reported here before. Different researchers, same subject, no new conclusions. Today's article offers a good explanation for laypersons, however, and is welcome. It is simpler to assume von Neumann's rules: propagation is as a continuous wave, but interactions are discrete. The appearance of particles is an artifact of the necessarily discrete nature of interactions (there either is an interaction or there isn't, there either is a branch point in the Feynman diagram or there isn't) together with conservation laws giving the illusion of persistent entities we call quanta; actually the wave function is the real thing that exists when we aren't looking and the interactions that give us the limited information that is all we can ever know about the wavefunction are being misinterpreted as being persistent rather than ephemeral. In the performance of a particle of fluid behave a wave, the special case when the Reynolds number is two, is gotten the threshold speed of equilibrium for the common performance of several kinds of particles. Aether has mass. Aether physically occupies three dimensional space. Aether is physically displaced by the particles of matter which exist in it and move through it. The Milky Way's halo is not a clump of dark matter traveling along with the Milky Way. The Milky Way is moving through and displacing the aether. The Milky Way's halo is the state of displacement of the aether. The Milky Way's halo is the deformation of spacetime. A moving particle has an associated aether displacement wave. In a double slit experiment the particle travels through a single slit and the associated wave in the aether passes through both. In a double slit experiment it is the aether that waves. This was a different medium than the flow of charged particles. The particle flow will create a conic field per particle, the particle group will also produce a more complicated field. Thus the slit experiment would report the field produced by the particles. There is no other field there. So if each particle produce an independent field, then of course the particles will produce a pattern as if the particles were waves. Why would this be misinterpreted? The problem witht the pilot wave hypothesis' assumption that the particle has a definite location is that it doesn't quite explain quantum tunneling. In quantum tunneling, the copenhagen probability wave of the particle reflects from the barrier while some of it continues through and separates from the main wave packet. The split-off part then decays to nothing, but while it does exist it can interact with other stuff by the wave collapsing and the particle appearing there. This is interpreted to mean that the probability wave IS the particle, so it can be in multiple places at once to jump across the barrier to act on one side OR the other. With the pilot wave hypothesis, we should see a quantum tunneling event where the particle doesn't tunnel through, but the part of the pilot wave that got to the other side would move other particles on the other side as if the real particle was there without the particle actually appearing there. To my knowledge, this has never been observed. For a bit of background to the previous; in wave mechanics, when you have a reflection off of a non-ideal barrier that isn't 100% reflective, some of the wave's energy always goes through. The barrier is seen by the wave as an abrupt change in the impedance of the medium, and where such step changes occur, reflections occur. Hence why coaxial network cables need a "terminator" plug at any unconnected end to lower the impedance between the open ends of the cable, so that the signal wouldn't reflect back and mess up with the transmission. So for any actual barrier that hasn't an infinite impedance, some of the wave's energy always gets through to the other side. In the copenghagen interpretation, the energy of the probability wave packet is considered to be the particle, so that it is spread out over space and exists simultaneously on both sides of the barrier until some point of interaction saps (collapses) the energy of the wave, which is when and where the particle appears. isproved experimentally. The tunneling was already modeled with water surface analogy. That provides a similiar phenomenon, but not quite the same. As I already explained, the particle is thought to bounce with the pilot wave, and the pilot wave goes through or over the barrier. The particle may be with that part of the wave or it may not be, which means it had tunneled or not, but the pilot wave itself always goes through. Were the pilot wave theory true then the part of the pilot wave that ended up on the other side should shake things up without the particle being present there. And such hasn't been observed. Every time something happens on the other side of the barrier, the particle pops up there. It's explained in my previous post. In this point I don't see any problem here. There is a difference in magnitude of the effect between the cases where the particle acts across the barrier, or has crossed the barrier. The pilot wave should be distinguishable from this because it adds yet another mechanism for the transfer of energy across the barrier aside from the know forces of influence. In other words, the pilot wave hypothesis implies a new means to radiate energy between particles, which has yet to be observed. All i know is causality is a definite absolute, and the most fundamental and challenging tenet of the Copenhagian interpretation is its all-too-willing acquiescence to an acausal kool-aid. The lowest substrate might be intrinsically indeterminable - that i can live with. But that's never to be confused with something causally inderterminate. First of all, I am not `Jixo' ! 2ndly, a few reality checks. Go to arxiv.org & type in John Bush, the lead author. His expertise is in fluid mechanics (6 pubs), & none in quantum physics. Historically, the invention of pilot-wave theory is credited to deBroglie (1927), however, its modern version now goes under the moniker of Bohmian Mechanics, after David Bohm who published it in 1952. Ironically, Erwin Madelung succeeded Max Born as the Chair of Theoretical Physics at the Goethe University in Frankfurt, & published his theory on`quantum hydrodynamics' in 1926 (same year as Erwin Schrodinger's discovery of wave mechanics), preceding deBroglie by a full year. "But some founders of quantum physics—notably Louis de Broglie—championed an alternative interpretation, known as "pilot-wave theory," which posits that quantum particles are borne along on some type of wave. According to pilot-wave theory, the particles have definite trajectories, but because of the pilot wave's influence, they still exhibit wavelike statistics." Many findings of last century were ignored with mainstream until their inventor/founder died. This leads effectively to the same result, like the "stopping" of inventor. Today it's not necessary to barbecue the fonders, like the Giordano Bruno. Due the immense flow of another information his ignorance has the same result, like the forceful silencing. In times of Giordano Bruno the scientific world was restricted to few hundred people at largest European cities. The scientific world now comprises all continents and the single person is so tiny piece of human society today. Didn't someone famous say - "Science advances one funeral at a time. "?